I *have* cast on the linen but it's really just a strip of sea green at the moment and not anything worth a look. I am finding the splittiness of the yarn to be more annoying than I remembered; but now that I am a couple of inches in, the stitches are not so tight and it is getting easier. I am looking forward to wearing the finished article so I think that will keep me at it. However, I needed something that I could knit in the semi-darkness as I caught up on Game of Thrones so I cast on (of course) some hexagons, in the Tahoe Lion & Lamb leftover from the clapotis I knitted nearly eight years ago. That makes me feel quite old. 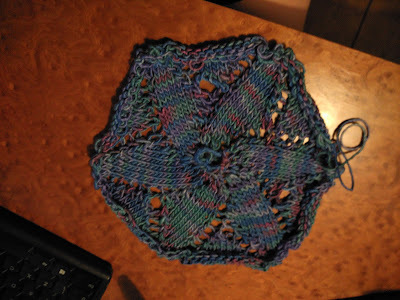 Anyway, the colours look lovely in the hexagon. I managed two of them this weekend, in between the linen and the napping. Fourteen down. 113 to go.